Commonly used for: Business, Cash Back, Excellent Credit, No Foreign Transaction Fees, Rewards, Sign-up Bonus. Free employee cards that also earn cash back and Visa Business benefits like auto damage and collision protection, emergency and travel assistance services and purchase protection. Capital One Spark Cash for Business ranks among the best business rewards credit cards on the market, edging out other business cards – including those offered by Capital One — because of its rewards flexibility. We love that this card pays the same flat rewards rate on cards issued to employees as those issued to the business owner. Plus, employee cards come with no annual fee. Capital One waives the annual fee for the first year on the owner’s card. You’ll pay $95 a year thereafter. Bankrate tends to favor rewards credit cards that make it easy on the cardholder to collect. Capital One Spark Cash for Business certainly does that with a 2% cash-back reward for all spending. This is an especially good card if your business expenses aren’t concentrated in small-business-specific categories. There are other cards that offer more generous rewards in spending categories typically associated with businesses, but be prepared to track your category spending. We also like that this card charges no foreign transaction fees, meaning if you or your employees do business outside the U.S., you won’t have to pay extra when putting spending on your credit card. 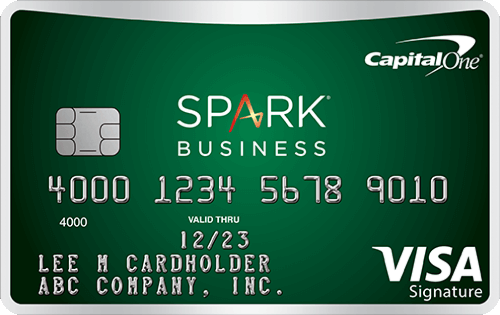 The Capital One Spark Cash for Business card will most likely appeal to business owners who want to keep things simple. This card is probably right for you if your expenses vary over the course of the year and aren’t concentrated in one specific category, like gas or office supplies. For business owners who put a fair amount on their credit cards, the sign-up bonus may be a key to your decision to apply: You’ll earn $500 if you spend $4,500 on purchases within three months of account opening. Like with most credit card choices, the best card for you comes down to your (in this case your business’) spending habits. If you spend heavily on office supplies, for example, there are better options that could earn you hundreds of extra dollars in cash-back rewards every year. The math here is relatively simple. If you spend $10,000 annually on office supplies, you’ll earn $500 cash back from some other cards. On Spark Cash for Business, you’ll earn $200. Cardholders earn an unlimited 2% back on every purchase. You'll earn a one-time bonus of $500 if you spend at least $4,500 in the first three months of card ownership. Employee cards earn the same cash-back rate, all credited to the main cardholder’s account. The Capital One Spark Cash for Business does not come with an introductory 0% APR offer like on other small business credit cards. The penalty APR for late payments is high, plus there’s a penalty fee, so if your business might not make a payment on time, you may want to consider a card with a more forgiving policy. The balance transfer APR is high so this card may not be a good choice for those looking to save on interest charges. If you rarely use this card, the annual fee after the first year may not be worth it. There’s no annual fee the first year, after that it’s $95. You will pay no foreign transaction fee for purchases made outside the United States. The annual percentage rate is a variable 19.24%. Along with the sign-up bonus and the free employee cards that earn cash back, this card also comes with Visa Business benefits like auto damage and collision protection, emergency and travel assistance services and purchase protection. Cash-back never expires and you can redeem it in any amount, anytime. There is no fee to redeem your cash back.